I have always been a big water drinker, but when I started running, I realized even more the importance of drinking enough water. Especially if you are running outside during the summer months like I do. 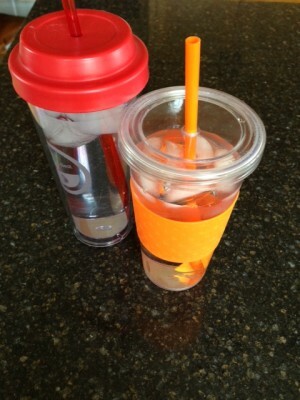 So today I thought I would share a few of my tips for drinking more water. And these tips are great for kids too. Kids play outside, swim, and are active during the summer, so don’t forget to encourage them to drink more water too. So yes that is pretty basic, but really just drink water. When you are thirsty grab water. Water is good for you and will quench your thirst better than anything else. Grab water first. This one is also pretty basic, but one I think a lot of people over look. If you drink coffee, tea, pop, juice, or anything else you will probably drink less water. Actually I think I can safely say you will drink less water. If you feel you need coffee, tea, or anything else, make yourself drink water first. If you want that glass of iced tea, tell yourself you have to drink 2 glasses of water first. 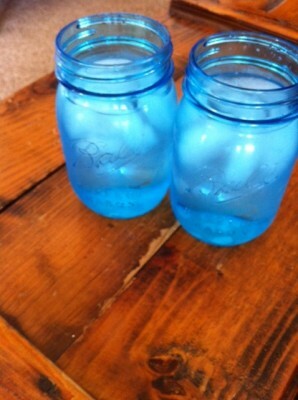 If you want two glasses of iced tea, make yourself drink 4 glasses of water. Or limit the amount of tea per glass you drink. Make a deal with yourself that you will drink water before you have anything else. I think this one is really important, especially when it comes to kids. If you have juice, pop, and other drinks around the house they will grab them instead of water. If I am thirsty and there is nothing else around to drink, I naturally grab water because that is the only choice. If you stock your fridge with sugary drinks, sugary drinks are what everyone will drink. Stock your kitchen with ice cold water and ice cold water is what you and others will be forced to drink. Yes, drink from a straw. I had several people mention this tip to me when I struggled with drinking enough water during the hot Oklahoma summers and it works. I got myself a couple of those iced coffee insulated straw cups and I love them. You will almost always see me with one. I keep one around the house with me and I take one in the car with me anytime I go out. And they never have coffee in them, I use them just for water. For whatever reason, drinking through a straw really does help me drink more water. My husband was a little skeptical of this one until he tried it and now he agrees with me. He has found he also drinks more water when using a straw. Now I know some of you are saying, but I don’t like water. I get that. Really I do. Neither of my parents like water. They drink it because they need to, not because they like to, but they have solved it by drinking various types of flavored water. I know a lot of people that love flavored water because it is water they will drink. And by flavored water I am talking just a little fruit or something in it. A sugary drink is very different from a flavored water. 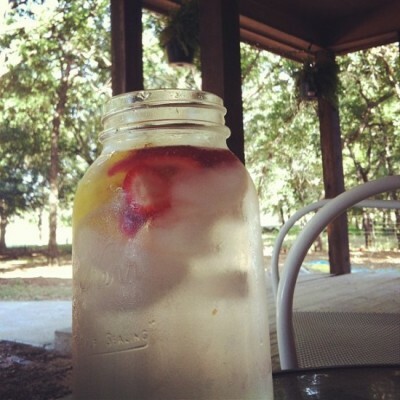 Need some flavored water ideas? Here a few simple ones to make. If you are really struggling with drinking enough water, especially this time of year, keep track of what you drink. Again this is a simple one, but I have found it works. Write down each glass of water that you drink so you know as the day goes along how much you have drank and need to drink. I did this last summer when I was running during our record breaking heat and it helped me a lot. Now I would love to hear your tips for drinking more water? Excellent article! I’ve linked to it in a post at The New Parents Guide that will be live tomorrow afternoon. I didn’t know about the straw idea–definitely worth a try! The links to the strawberry lemon water and then to the spa water is not working for me. I am not positive if it is your error or my computer. I would really like to see the articles to those links though. I love adding fruit to my water especially lemon or lime. I am definitely going to fill a pitcher with fruit water right away and go buy a reusable cup with a straw. I live in Oklahoma too so it will be great for the hot summers and will help curb my temptation to stop for a drink at a drive thru when I am out shopping. That site was down earlier today, so I would try back later. They should work then. I ditto that having a straw helps, as does counting to keep track – and for me, so does having a handle. I have a 24 oz Tervis (which, with the lid & straw only fits about 20 ozs) with a handle, and I take it with me everywhere. I know I need to drain it at least 4-5 times per day, so I often find myself frantically drinking 2 of them while I’m reading/watching TV at night, but it helps! It kind of goes along with the straw, but something about having a cute cup makes me more willing to drink water out of it! I saw on a newscast that drinking from a straw gives your mouth vertical creases just like cigarette smokers can get. They said if you have to drink out of a straw, drink out of the side of your mouth instead of pursing your lips around it. I can’t remember which evening news it was on. If I find it, I’ll post link. we definitely find the straw idea to be true! i also like crushing some fresh mint into water. Great article and I am working on drinking more water each day. Great idea to add fruit! I found two 32 oz. water bottles that had the straws that closed and it had has a freezer tube inside that keeps the water cold all the time (I hate hot water). It also has a hook and handle that I can hook to my purse or just hold on too. Then on the outside of the bottles I marked how much I had to drink by a certain time. I did it by hours, so I would have, at the very least, have 64 oz of water drank by the 6pm. I usually would drink more than that though cause it was always with me everywhere I went. I would also flavor my water sometimes just for a change of routine. My boot camp instructor suggests we pour the amount we want to drink in a day into a pitcher and then as we drink it we can see the progress. Icy cold lemon water is my water of choice. I make it strong, too, like lemonade without the sugar. The straw idea works for me as well. I find the narrower the straw, the more I drink. I carry my water with me everywhere I go. I’m to the point now that I feel like I’m forgetting something if I don’t have glass in my hand.